The classic game of Reversi, aka Othello (tb) for the Palm Pre. At your choice the Pre can show where you can move and the flip count of that move. You can set the computers smartness or stupidity. Prior to 2009-08-08 the version was incorrect. The uploaded version now matches the screenshot. 2009-08-08 User controls and game play controls now in place. 2009-08-19 Help and about screens complete. Pref's screen present but not hooked up. 2009-08-23 Prefs screen fully operational. Game Graphics substantially improved. Splash Screen. 2009-08-31 alert dialogs on no move available. Game Win dialog. 2009-09-13 Updated Graphics, Improved ABOUT screen, Palm compliant Help screen, improved Rules and History screens, improved Pref's screen, Three themes to choose from. Slightly improved game play, High score manager. 2009-09-14 - 1.0.19 - fixed chips switching with themes. 2009-09-15 - bug fix - changing colors mid game hung the game. oooops. Thanks cwgtex for the report! The AI is very stupid. 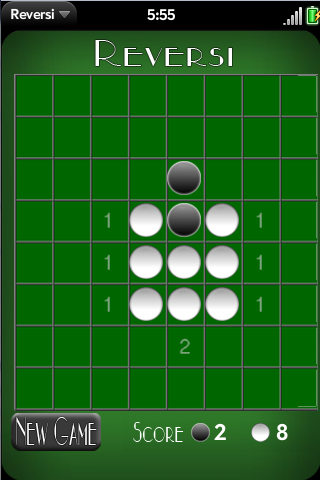 Anyone post "absolute beginner" can beat this version of Reversi. It is not a game for advanced players.